Nobody has a greater understanding of the harmony of color and reflections. Ah, Chardin, what you grind on your palette is not this color or that, red, black, or white, but the very substance of things. Jean-Siméon Chardin impressed critic Denis Diderot with his unique style and impeccable technique, which he applied to what was then considered a lowly genre, the still life. Exemplifying what Diderot noticed in his paintings, Chardin here transforms a simple kitchen scene with a subtle palette, innovative composition, and virtuoso brushwork. The objects' arrangement is spare but dynamic: Two mackerels hang vertically in front of a plain background, perpendicular to an arrangement of food on the tabletop below. Brilliant light directs the eye, attracting attention to the shiny fish, leafy greens, root vegetables, a wheel of cheese, and covered bowls. Although the overall palette is subdued, the oil and vinegar cruets are infused with rich color. 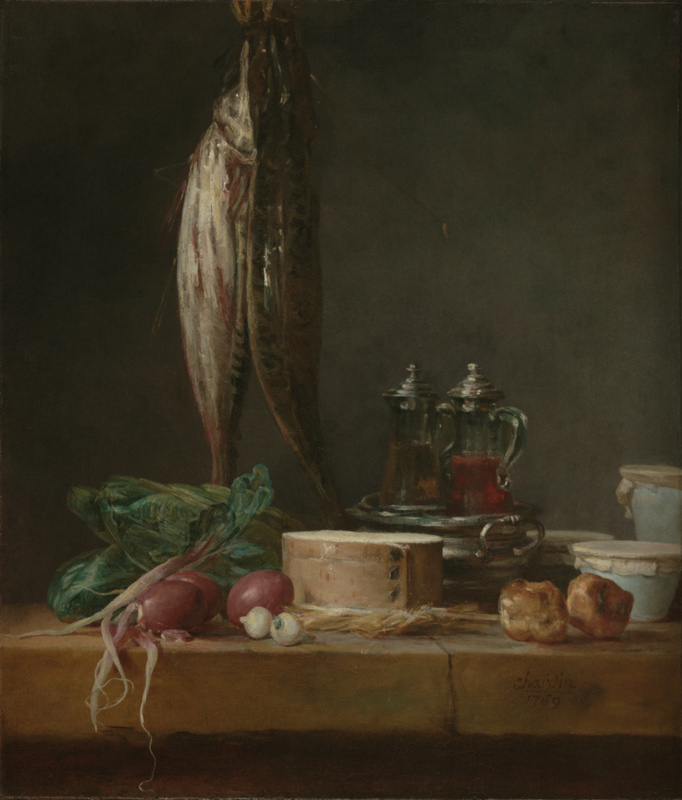 The signature and date in the lower right corner are the last Chardin is known to have applied to a still life. Phoebe Cowles Revocable Trust (San Francisco, California), sold to the J. Paul Getty Museum, 2003. Freedberg, Sydney J. The Sources of Modern Painting, exh. cat. (Boston: Institute of Modern Art, 1939), p. 26, no. 9, ill.
Parke-Bernet Galleries, New York. Important Examples of Modern Art [...] The Entire Collection of Mrs. Cornelius J. Sullivan. December 6-7, 1939, pp. 86-87, lot 185, ill.
"The Sullivan Collection." The Magazine of Art 32, no. 12 (December 1939), pp. 710-11, ill.
"A Notable Auction of Modern & Other Art: The Collection of Mrs. Cornelius J. Sullivan." The Art News 38, no. 8 (November 25, 1939), p. 10, ill.
Rosenberg, Pierre. Tout l'oeuvre peint de Chardin (Paris: Flammarion, 1983), p. 115, no. 3, ill.
William Doyle Galleries, New York. Important 17th & 18th Century English and Continental Furniture and Decorations Including Old Master Paintings [...]. January 25, 1989, p. 12, lot 80, pl. IV. Roland Michel, Marianne. Chardin (New York: Abrams, 1996), pp. 176-77, ill.
Rosenberg, Pierre, and Renaud Temperini. Chardin: Suivi du catalogue des oeuvres (Paris: Flammarion, 1999), pp. 151, 184, 281, no. 91, ill. The J. Paul Getty Museum Handbook of the Collections. 7th ed. (Los Angeles: J. Paul Getty Museum, 2007), p. 127, ill.
Malaguzzi, Silvia. Food and Feasting in Art. Brian Phillips, trans. (Los Angeles: The J. Paul Getty Museum, 2008), p. 282, ill.
Rosenberg, Pierre, et al., eds. Chardin: Il pittore del silenzio, exh. cat. (Ferrara: Ferrara Arte, 2010), pp. 198-99, no. 65, ill., entry by Pierre Rosenberg. Martineau, Paul, ed. Still Life in Photography, exh. cat. (Los Angeles: The J. Paul Getty Museum, 2010), p. 9, ill.
Rosenberg, Pierre, et al., eds. Chardin, 1699-1779, exh. cat. (Madrid: Museo Nacional del Prado, 2011), pp. 206-7, no. 65, ill., entry by Pierre Rosenberg.